New Career | AUTHOR. ACTOR. SWORDSMAN. Bugger this writing business! All that angst and sleep deprivation! 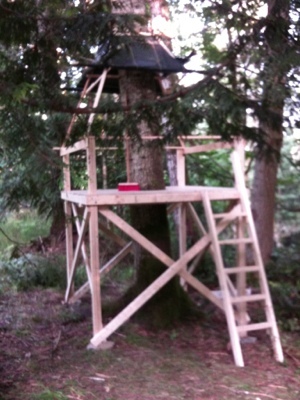 Let me do what I did this weekend: be a builder of treehouses. Ok, full disclosure – I am an ideas man. A delegator. A conscriptor of talent. I don’t know one end of a jigsaw from another. But Gerald does. He drew up the plan, talked 2by’s and lag bolts at the yard. I paid. And I lifted, hammered, sawed as directed. I also cut and fashioned the tarp for the roofing. There you go. I’ll be a sailmaker/treehouse builder. Got to be easier than being a writer! This entry was posted in Uncategorized and tagged treehouse, Writing. Bookmark the permalink.